My blog has been a bit quiet lately as I have been away on an internet-free trip to the Canadian Rockies for the last two weeks. There’s not much I find more refreshing than a trip away to the outdoors without internet. To enjoy some peace and quiet and adventure in the mountains. We saw glacial U-shaped valleys, glaciers, rushing rivers and waterfalls, quiet braiding rivers and wetlands, ice and snow, lakes frozen over with ice and lakes green with glacial silt. A lake just outside Golden, BC which lies along the Columbia River in the Southern Rocky Mountain Trench just to the west of the Rocky Mountains.The Rocky Mountain Trench is the longest linear valley in the world. Where have I been? My partner and I visited the Canadian Rocky Mountains World Heritage Site including Yoho, Kootenay, Banff and Jasper National Parks. The parks all share borders along the British Columbia-Alberta provincial boundary along the backbone of the Canadian Rockies. The trade-off is cooler and more unpredictable weather. For two people who hate temperatures above about 25C, that is just fine with us. However, we wound up striking it lucky. Spring came early this year in the Rockies and it was unseasonably warm all April with most ski-fields closing early. 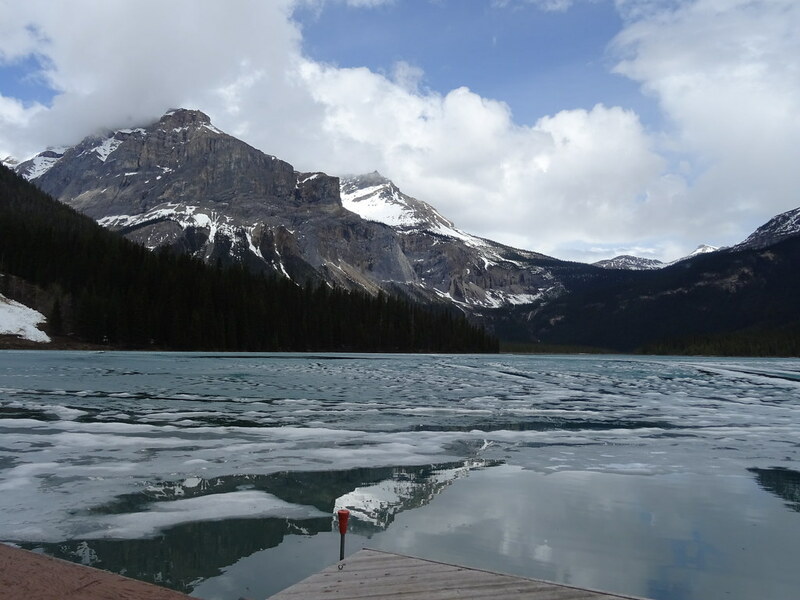 Emerald Lake, Yoho NP, BC still partially iced over in the early spring. Given my new birding hobby, I was quite excited to see new birds we don’t have on the island. After seeing elk and pikas our first time in the American Rockies, I also knew we could expect to see other amazing wildlife, too. Pika (left), elk (right) in Rocky Mountain NP, Colorado, US. Early spring is an excellent time to view wildlife in the mountains and we had some exciting sightings which I will share with you soon. Until then, enjoy a preview of some of the beautiful alpine scenery we witnessed. The Kootenay River coloured grey-green with glacial sediment rushes downhill near Marble Canyon, Kootenay NP, BC. A waterfall in Johnston Canyon, Banff NP, Alberta. Part of the 325 square km Columbia Icefield along the Icefields Highway, Jasper NP, Alberta. A beautifully crystal clear lake in the Valley of Five Lakes, Jasper NP, Alberta.